Leave tarnish in your wake! 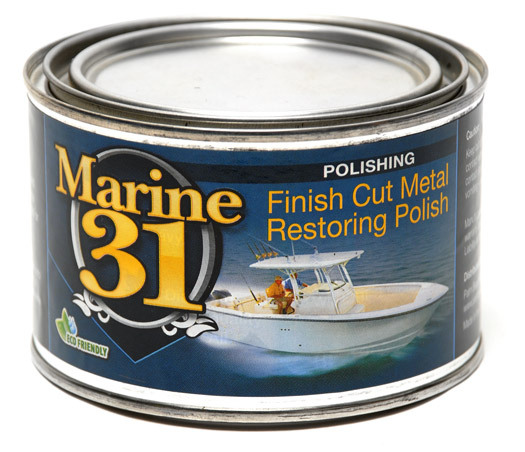 Marine 31 Finish Cut Metal Restoring Polish is the ideal choice to restore tarnished and corroded metals. It removes minor blemishes, haze, oxidation and restores a brilliant shine on metals such as aluminum, brass, copper, stainless steel and more! Give your boat's brightwork the shine it deserves and leave tarnish in your wake with Marine 31 Finish Cut Metal Restoring Polish. A mirror finish on your boat's rails, fishing rod holders, and trim looks brilliant. It is a shine that sparkles with brilliance, even from a distance. Unfortunately the tough sea environment is working hard to rob your uncoated metals of their shine. Salty ocean air and moisture quickly stain and oxidize metal, hiding the shine behind a layer of tarnish. Marine 31 Finish Cut Metal Restoring Polish quickly cuts through tarnish and oxidation, giving your boat's metal a mirror-finish that you can be proud of. Marine 31 Finish Cut Metal Restoring Polish is formulated with an anti-corrosive protectant that seals the polished metal against the elements. Like the rest of the Marine 31 range, Finish Cut Metal Restoring Polish is eco-friendly and harbor-safe. A Tip From The Captain's Chair: Protect your metal even more by applying Marine 31 Gel Coat Carnauba Wax + Sealant to lock in the shine and fight off oxidation.